I enjoy developing new dishes as well as trying different foods when I'm dining out. But, I've recently been baking a lot and made a new pie for our weekend dessert. I cannot have much sugar in my diet, so I prefer less sweet desserts when it comes to them, if any. 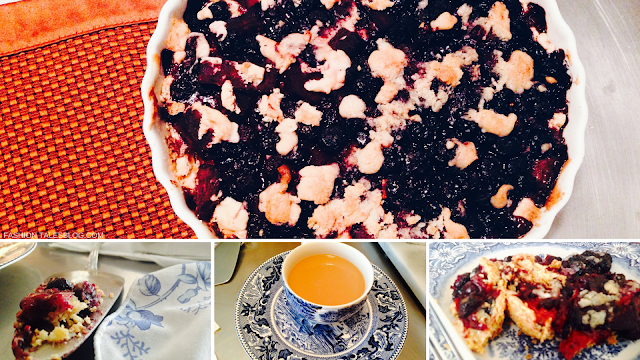 But, if you have dessert lovers at home, well you learn to accommodate in some way, right? Here's where you can meet in the middle. I was a stealthy baker and added a root vegetable to the pie-filling. Beets have a sweet taste anyway, so it was perfect. 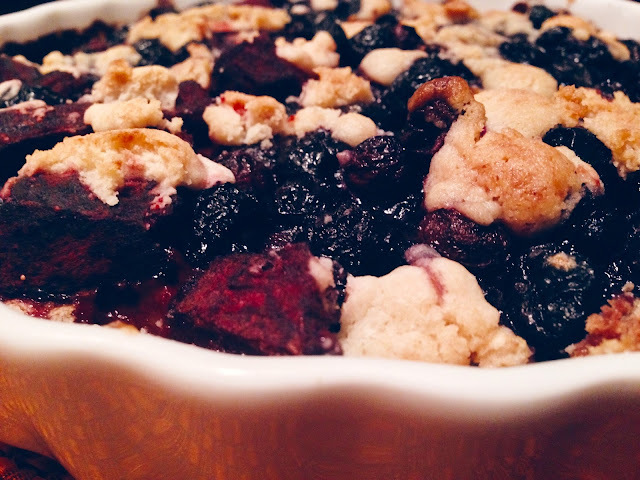 This blueberry pie crumble has beets mixed in the main filling, so it's quite a healthy twist to the traditional pie or streusel, but very delicious! There's just enough sweetness to satisfy your craving, with a delightful hint of citrus lemon, and almond to balance out the earthy-fruit flavour and rich crust combination. Making the pastry: combine the flour, butter, kosher salt, brown sugar and coconut sugar in a food processor. Mix on a medium speed for about 20-25 seconds, until the mixture has a loose soil texture. Gradually add 1 tablespoon water in the food processor as it's running, until the mixture comes together into a dough. Check the dough. You may need to add a little more flour or water. On a lightly floured work surface, roll the dough into a rough circle. Wrap in plastic wrap and chill in the refrigerator for 30 minutes. 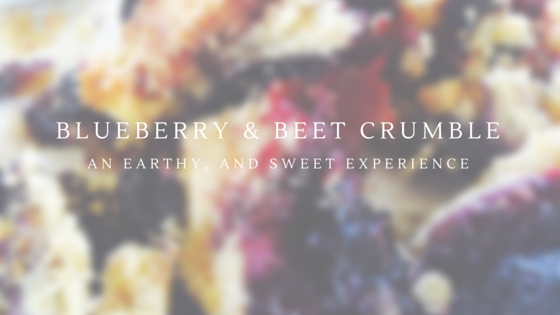 In a medium bowl, pour in the blueberries and beets together. Sprinkle 1 tablespoon icing sugar on top. Mix for about 5 seconds with a spoon. Set aside. Next, make filling: mix together the egg yolks, icing sugar, fresh squeezed lemon juice, almond extract, and lemon zest in a bowl. In a separate bowl combine the crumble ingredients until the mixture has a sand-like consistency. Preheat the oven to 180°C. Take out dough/pastry. On a lightly floured surface, roll out the chilled pastry to a thin layer (approx. 4 mm). Next, line the base of a 4 cm or 5 cm deep, 20–25 cm round ceramic baking dish with the pastry. Spread the filling over the base, then fill it with the blueberries and chopped beets, and disperse crumble mixture on top. Bake for 35-40 minutes, or until the pastry is browned, and some of the crumble is browned slightly. Serve warm with a dollop of fresh cream. Side notes: you can buy frozen beets, or beet slices already cut if you prefer. You may need to add an additional 5-10 minutes to cooking time if frozen. I used the convection oven. *Step 2 alternative: after rolling out the dough, it can also be chilled in your baking dish if you prefer. Pressing the dough and forming it with your hands in a thin layer in your baking dish or baking tin, build up dough on sides of baking dish for an extra crust. Then, place in freezer for 30 min. How amazingly delicious this look and do worth to try thanks.